The TypeFinder is based on the 16-type framework proven to improve communication and understanding in companies large and small. The TypeFinder is administered online, through our user-friendly website. Easily purchase tests, send them to clients, and view results online. Unlike other tools, you don't need to spend thousands of dollars in training fees to start using the TypeFinder. Jargon-free reports let you dive right in. Professionally developed and validated, the TypeFinder gives you accurate results that you can rely on. TypeFinder tests start at $29 per person, with discounted pricing down to $9/test for large groups. When you're ready to start testing, you can purchase tests online and get instant access to your testing platform. A reminder to appreciate my strengths, but remember to soften my natural style when interacting with others. I struggle emotionally when I find myself in situations or tasks that I'm not suited for, and your explanation of my strengths help me know why. I plan to use this to help me stick to tasks that I'm most suited for. I found the "advice" very interesting. I scored an ENFP, and I work as a Life Coach. I guess I really did get into the right business. I just like seeing what I view as my positive attributes written out. Because then I remember they exist! It was so on point with many aspects of my personality that a couple times I spontaneously murmured, "Whoa." I was very surprised by the level of precision achieved through this test. I LOVED it. Definitely hit the nail on the head. I was surprised to find I was an extrovert, but all the descriptions are right so that must be right as well! It's always interesting to learn things about yourself and ways to improve. The accuracy in this test is amazing! 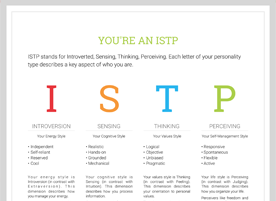 The test confirmed what I know about myself and reminded me of ways I already know to improve, which helps me be even more dedicated to working with both my strengths and weaknesses. I'm amazed at how so few questions could yield such accurate results! You really got my personality right on. It helped me to evaluate my own psyche and figure out what I need to be doing with my time and energy. This was really good. I appreciate the pitfalls part. It repeated the criticisms that I recently received from my boss during a career discussion. I loved receiving reassurance on my potential pitfalls. These are things I have acknowledged I have difficulty with and this helped me to know I am focusing on the right things to work on!